The Strollerscommunity theater will conclude its 87th season with a presentation of the classic musical Fiddler on the Roof, with music by Jerry Bock, lyrics by Sheldon Harnick, and book by Joseph Stein. 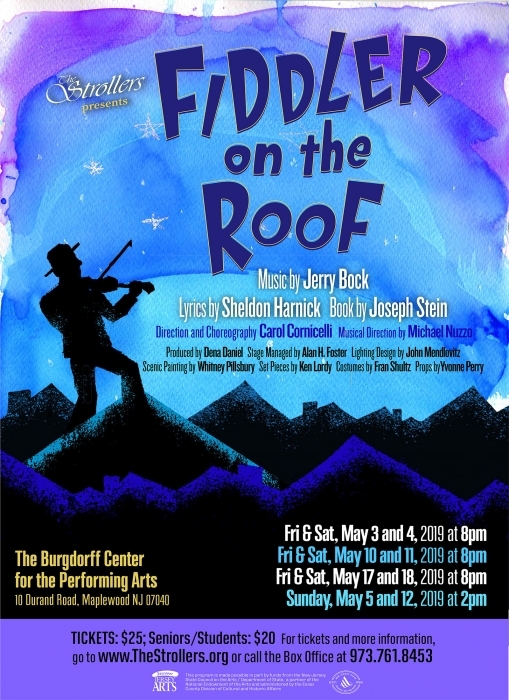 The production will be presented for three weekends at The Burgdorff Center for the Performing Arts, 10 Durand Road in Maplewood: Friday, May 3, 10, and 17 and Saturday, May 4, 11, and 18 at 8:00 pm; and Sunday, May 5 and 12 at 2:00 pm. Tickets are $25 for adults and $20 for students and senior citizens. Visit www.thestrollers.orgfor information and to purchase tickets, or call 973-761-8453 to reserve tickets.